DaveCC - Ohio Great Fitment "Plastics fit perfectly. Plastics look great." George perfect match for xr650l honda "very cool and easy to install"
In 1973, Franco Acerbis put an end to all the mudslinging. After being in the middle of it early in his race career, Acerbis created the NOST front fender - a longer and wider version than the stock fenders. He produced three, one for him, one for the local champion and the other to sell. Other riders noticed the results and Acerbis made 30 more. 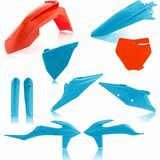 Today, Acerbis is an international selling company of innovative and protective aftermarket accessories for dirt bikes. Franco Acerbis said his company's slogan is "Soul and Passion" and it's this enthusiasm and commitment that Acerbis strives for today. Acerbis still makes mud defeating front fenders. Rear fenders too. Plus a whole lot of other accessories and dirt bike parts designed to make your ride comfortable and ready to take whatever trail or track roost kicks up. Check out the Acerbis line of hand guards, swing arms and even fuel tanks. Acerbis also has body protection, head lights, taillights and rear view mirrors, among many other dirt bike aftermarket parts. MotoSport carries a full line of Acerbis products. Our most extensive collection is with Acerbis dirt bike parts where you can find those fenders and other protective gear for your bike as well as extra accessories like seats, skid plates, and a bike stand. 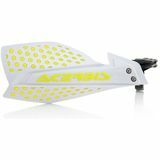 We have Acerbis rider protection and a compact fender bag that mounts on the rear fender. MotoSport is the Acerbis specialist you need to find the right look, the right style and the right fit. Want help? Call our toll free line 866-677-7338 or chat with an expert. Get the largest selection of Acerbis dirt bike parts and accessories delivered to your door and free 3-day shipping on any order Over $79 (certain restrictions apply) from MotoSport!